I’ve always been fascinated by the work of inventors. It’s such a creative act, bringing into existence something that changes how people live. The resulting product often integrates itself into our world to such a degree that it becomes difficult to imagine a time when it didn’t exist. They say necessity is the mother of invention. But what about all of those things we create for no better reason than we simply want them? Or because we wonder if we could create them? Or because we just have nothing else to do? In addition to a mother, invention seems to have an extended family, including a weird uncle called Curiosity. Could I make it as an inventor? I have an inquiring mind. I sometimes put on a pair of fleece sweatpants, walk around really fast, then go into a dark room and take off the pants just so I can see the sparks of static electricity. This, I tell myself, is the sign of a curious seeker of knowledge. It could just as well be, I answer back, the sign of a madman. An argument usually follows and occasionally a great altercation ensues, often escalating to fisticuffs. This doesn’t help things at all, because I hate that word, fisticuffs. What a pathetic word. It doesn’t sound at all like what it’s supposed to mean. When I hear fisticuffs, I think of men in tuxedoes swatting each other with white gloves. It reminds me of a word I used to see in my social studies textbooks: foodstuffs. What in the world are foodstuffs? Wouldn’t the word food serve the same purpose? Peoples is another one. And monies. I think they used four-year-olds to write those textbooks. A few years ago I was in a London hotel room. I had a heating pad with me, because I had ruptured a disc in my lower back and was in a lot of pain. I used the heating pad in the airports and it helped me survive the ordeal of travel. In the room, I plugged the heating pad into an electrical outlet clearly labeled, “For electric shavers ONLY.” What could possibly happen? That’s what I was asking myself when I turned on the switch and caused the explosion, a rather loud one, although any explosion in a hotel room tends to be unexpectedly noisy. A thick cloud of black smoke shot out from the outlet and sent a stream of soot across the nearby bedspread. I didn’t actually see the smoke and soot until I opened the door, because the room immediately went dark. When I went down to the front desk to explain what happened, they didn’t seem to understand that I was apologizing for something that was my own fault. The hotel manager came out and began apologizing to me. I tried again to explain, but he continued to tell me how sorry he was, and arranged for someone on staff to move me to a different room. It took five tries to find a room with working electricity. Apparently I had knocked out power to the entire floor. When I checked out three days later, the desk clerk again apologized for any inconvenience. I considered demanding that they replace my heating pad, but felt way too guilty. It had to be a man, didn’t it? I can’t imagine those words coming out of a woman’s mouth. For one thing, most women don’t have that kind of free time on their hands. And speaking of sitting in a chair, at the suggestion of my dental hygienist, I recently started using an electric toothbrush. I had often ridiculed this invention as unnecessary and lazy, comparing it to the electric carving knife, possibly the most idiotic thing to come out of the 1960s, other than the Super Ball, a dense rubber toy that cost a small fortune, bounced into the upper atmosphere, and always landed on a roof or rolled down a sewer within minutes of purchase. But now, lying flat with a searchlight shining directly into my eyes and a young woman stabbing me in the gums with a sharp metal instrument, I reconsidered. “Which one is day?” I tried to ask, but she had her entire fist in my mouth and even I found it hard to understand what I was saying. I went out later that week and purchased an electric toothbrush. I use it every day. And I use my regular toothbrush every night. I really do. So my dental hygienist called it exactly right. This got me thinking. Why not an electric hair brush? Not only could you brush your hair without causing irritating arm fatigue, but you could also use it to remove unsightly pet fur from furniture, and as an occasional head scratcher and scalp massager. From there, it’s a short step to electric Q-Tips, battery-powered nail files, and small lamps that run on static electricity generated by fleece sweatpants. No, it won’t be long now. One day soon you’ll find it difficult to imagine a time when these amazing inventions didn’t exist — each the product of an inquiring mind, a curious seeker of knowledge, and of course, that weird uncle engaging in some mental fisticuffs. So, that was you with the “electric shaver only” outlet? My friend in England, who used to work in a hotel, told me some Americans had a hard time with this concept. 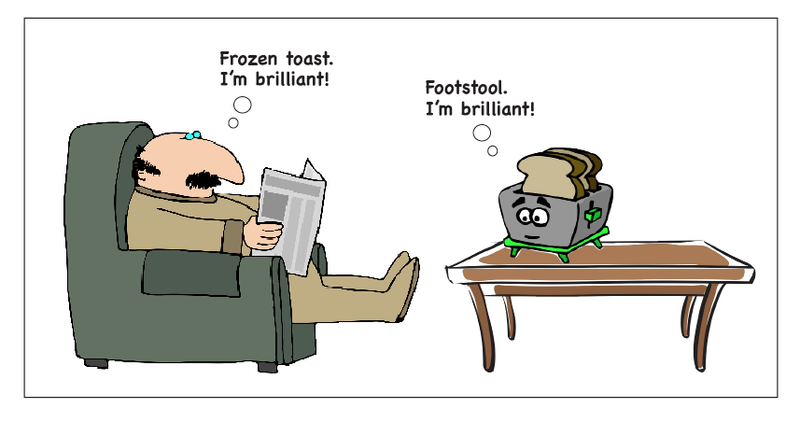 That frozen toast cartoon made me roar. Please tell your friend that I’ll never do it again. I still don’t understand the concept, but I definitely believe it now. Thank you so much for making me smile this morning! I particularly enjoyed the visual image of your “seeker of knowledge” persona battling it out against the “madman”–and you’re right, “fisticuffs” is a silly word and there’s no way a woman came up with the silly idea of pole vaulting! I hope you always encourage the “weird uncle”–your curiosity is intriguing and makes for such wonderful posts! Thanks, Iced Tea. I’m glad the madman image didn’t scare you away. I don’t know why, but I’m rather fond of fisticuffs, the word, not the act. Then again, I like weird words. Would it be a giant leap to assume you, too, often think, “It seemed like a great idea at the time”? Frozen toast that you put in the toaster to warm up which would take the same amount of time to make real toast. Yep, can’t understand why that has not been thought up and marketed. Someone’s probably stealing the idea right now. I share your disdain for the word “fisticuffs”, Charles! Just say “fight” and get it over with! Thanks, Wendy. I look forward to reading that post. Here’s the post your post inspired, Charles! I think yours is much more interesting. This was hilarious Uncle Charlie! Thanks for sharing your brain with us once again 🙂 Yes, I made the pizza in this picture and yes it was awesome! Thanks, Katie. Uncle Joe would be proud of that pizza. Aren’t certain animals, such as cows, called ruminants? I would say that based on what goes through my mind, that’s probably a close match. Yes, I think you’re right on both counts, but since the cows’ experience is physical and somewhat graphic, it’s much more gross. Makes me sh-udder just to think about it. Seems like so many of us hate the word “fisticuffs”! Perhaps one of us should start a petition to have it banned from public speaking and in written form. But on a more important note – why do hotels in England have outlets that are just for electric shavers? That just bugs me. I was intrigued that you would even think about what the Eskimos would burn in their igloos – that thought has never even entered my mind. I always wanted to know how they could have fires in there without melting the ice. I understand that the ice is thick, but after a while, wouldn’t they increase the interior square footage? Or would they end up with a skylight? Maybe this is how Eskimos renovated their homes without hiring contractors. I tried the petition idea, Jac, months ago. I stopped people on the street and even went door-to-door. Everyone told me to go away. As far as the fire inside the igloo, yes, wouldn’t everything get wet? And melting ice is still cold. I think we were lucky to have been born where we were. Hey, Uncle Charlie, I have an idea. Invite us to your place so we can pool our secret ideas for inventions. The real excuse? To have Kate make some of that scrumptious looking pizza. Would I qualify? I’m working on self-cleaning windows. Amy, you’d make a fortune with that one, but I think you just gave it away. I’m thinking about the pizza, too. Great to join you here, Charles. Enjoyed your latest musings! Thank you, Sarah. It’s always good to hear from you. Um, Charles, your hygienist intended for you to use JUST the electric toothbrush, day AND night. Not to drill for too fine a point, but it might save you some money to quit with the manual one. My favorite cartoon is a drawing of a husband and wife sitting at the breakfast table. He looks over his newspaper at her and says, “Honey, help me think of something to invent.” That’s the thing about inventing – you can’t think too hard about it — you just have to let the idea flow into you. Hmm. A device that flows ideas into you … Get on it, Charles! And again, you seem to have invented superb writing – awesome phrasing, word choice, delivery and rhythm. You invent a laugh for me every time I read your stuff! I know she meant that, SDS, but I’m still in the transition phase. I’m not like those heartless people in the Swiffer commercials who just toss their old brooms away as soon as something better comes along. Loyalty matters, even to a toothbrush. Then you’re even a more decent and sensitive person than I originally thought – loyalty even to inanimate objects. You have a big heart, Charles! I love the idea of generating power through the static electricity of fleece pants. That tops wind energy in my mind. You should really start talking to the people of General Electric. You could be a millionaire, maybe open your own laboratory for test inventions! Thank you for the encouraging words, Jess. I thought for sure you were going to say those sparks were really ghosts. I had the same thought as RumblyCottage on the toast so I’ll leave it at that. As for the electric toothbrush, I had one as a child and hated it. Couldn’t figure out how to NOT keep snapping those things in half, and Mom was getting really irritated, and I found myself eventually turning off the juice & using it like a regular toothbrush. When I discovered my parents had stopped using it as well, that was that. Mitch, I’ve had the electric for months now, and use it every day. But still, I occasionally forget and unconsciously pick up the regular toothbrush and start using it. 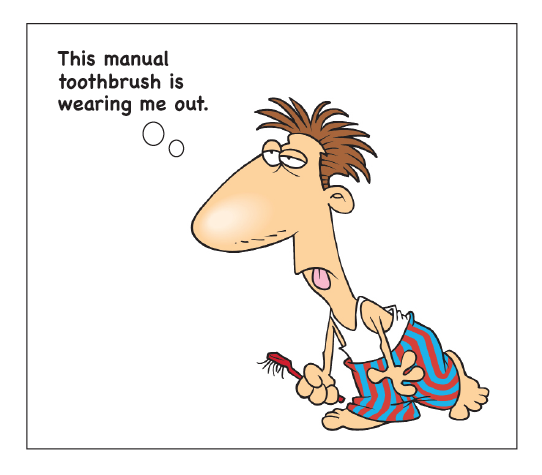 Old habits really are hard to change, and brushing our teeth is a very old habit. Hilarious, as usual! I am so lucky to have such a creative father. Thanks, Al. But I have a strange feeling that the word creative may be a euphemism for something else. I still cringe when Singaporeans say “stuffs”. They also say “maths”, but that is a Brit thing, and they are always right and Yanks are always wrong. Just ask them. I don’t reply to email invitations to have a “cuppa”. Doing so would honor that horrible word with a response and therefore validate it. Or I suppose that should be “honour”. Oh yeah, used an electric toothbrush until last year when mine stopped being electric. My dentist said using them too much can be bad for your gums. I thought I’d really miss it. I don’t. And I don’t miss $20 brush heads either. There’s a lot of electric things we don’t need to be electric. I’ve warmed up to the word maths just recently; mathematics is written as a plural, so why not its abbreviation? As for the electric toothbrush, I’d imagine using it too much would be bad for you, just as washing your hands too many times will cause irritation. I agree with your very last statement, though. 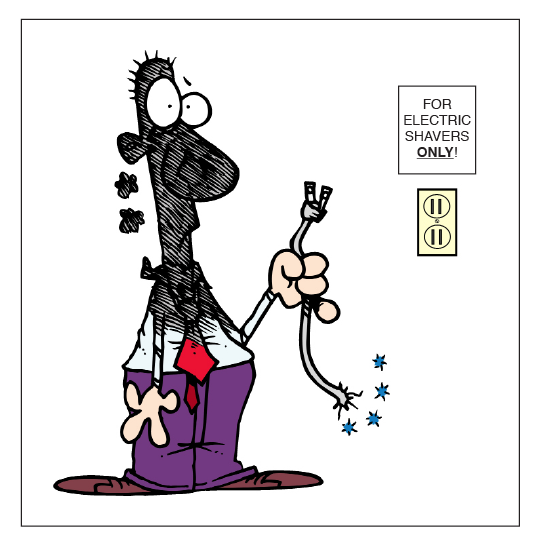 We assume anything powered by electricity will be easier and more convenient, and that just isn’t true. “There’s a big bag of feathers on the other side and I land on that, usually. When I get really good at it, I’ll raise the stick and try again. I think this is going to make ostrich.” (Note the last word). I think you just see things with an artist’s eye, Val. There’s no way I’d want to mess around with that. I always assumed that pole vaulting originated when some poor short-legged caveman needed to get across the gorge to the cute little blond on the other side. How else to spring across an expanse that would surely swallow you if you couldn’t figure out how to cheat death? But I absolutely lol when I read the part about the frozen pre-toasted toast! And I don’t lol very often. Thanks. I needed that. I’ll probably live an additional year or two, thanks to you. I hadn’t though about the possibility that pole vaulting began as a practical invention. I suppose canyon-jumping could have useful applications. But again, who was the first one to test it out? Thanks for the nice words, Linda. Getting to read your blog for an additional year or two will be a great payback. Love the frozen toast! I’d like to add that alomg with my line of dehydrated waters. I got a charge out of your lightning experiment because we use flannel sheets in the winter and I wear sweats to bed when it’s cold but I must try not to toss about because whenever I roll over the room lights up. I suspect your problem with hotel electricity had to do with their using Christmas tree light wires in their last electric upgrade. Another great read Charles, Thanks! Actually, it was a brand new hotel, Allan. But I learned my lesson: ONLY means ONLY. Dehydrated water — think of the savings in shipping costs alone! I really don’t know why you and I are wasting our time with this writing stuff. The world needs us. Inventors fascinate me. It seems to take a leap of creativity to be an inventor–at least a successful one. When I try to take leaps of creativity, I tend to fall on my face. So most of the time it’s easier for me to think about truly inventive, creative people as divinely inspired, preternaturally blessed. That lets me off the hook. Of course it comes from a Latin word that just means “find.” So maybe I’m trying too hard. Kevin, that’s exactly the feeling I get when I see some brilliant new thing that will obviously be around for a long time: it was always there; we just had to catch up to it. Thanks Uncle Charlie…I wish I could make some for him! I wish I could make it for all of you! The whole family! I love you! Since we are friends, could I please ask you to increase the functionality of the electric hairbrush from an “occasional head scratcher” to “auto head scratcher”? Please? It’ll be cool to have a tool that ‘knows when to’. That’s going to require some pretty intensive computer programming. Also some kind of strap. Do you know anything about computers? I could probably design a strap. You just have to market your static suit along with a nylon carpet swatch and you’re already there! Imagine the fun wives all over the world will have watching their fleece wearing husbands shuffling their feet around, listening to all the electric snaps and ouches as they remove the outfit and then emerge with their hair standing on end or out sideways, depending on male pattern baldness. If you throw in a supersoaker squirt gun full of Static Guard and paint a bullseye on the back of the pants, you’d have an entire game on your hands. You just have to take it to the next level! Jessica, I’d say you’re already three levels ahead of me. So you take it; this is your baby now. Really, I insist. I’m thinking that overuse of a toothbrush, or toothbrushes, is way better than underuse. I would think so, too, Julia. And I imagine millions of dollars have been spent on studies trying to determine if that’s true. Oh my the frozen toast idea cracked me up as well as how the pole jump was invented. I can only imagine the entangled mess an automatic hairbrush would cause, but I’m all for testing a scalp massager. I think that is a winner! I just found out, the electric back-scratcher already exists. It would have to have a scalp attachment. Wouldn’t it? I had a husband once, long story, who actually purchased numerous electric brushes. More like an electric comb really as it untangled my daughters tangled hair really well. However, the husband had hair that was sewn on his head. AND that is no joke. He was bald and that’s what they did then. I think it addled his brain. It’s my first stop here. I shall be back. I like the fisticuffs. It makes fighting seem so polite. Boy, if I could attribute my addled brain to an electric comb, I’d be happy. Thanks, for the comment, Sheryl. I look forward to visiting your blog very soon. Yeah. 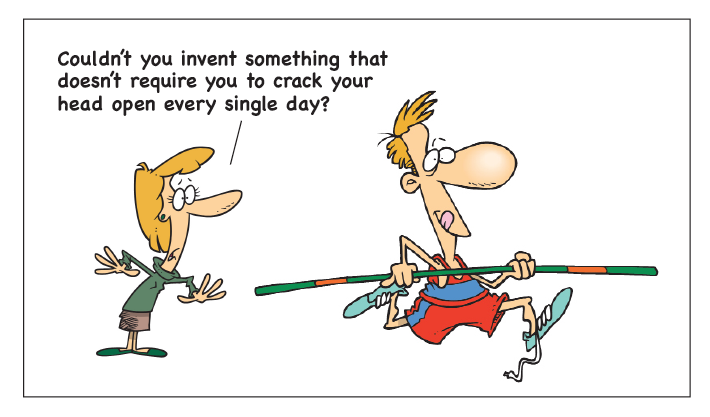 I’ve never invented anything either. Kevin, I would have preferred it to happen to you first. Then you could have warned me. But I guess it’s too late.